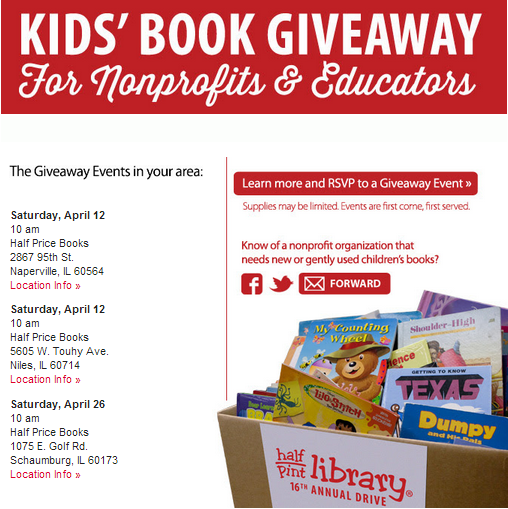 Half Price Books Kids Books Giveaway | A Savings WOW! To participate, register by filling out the form on Half Price Books’ website. After registering, you will receive a confirmation email. Print out and bring the confirmation email to the event to check-in. Books donated through the Half Pint Library program are not to be sold at any time for any reason. Depending on the number of books collected and the number of agencies coming for pick up, quantities may be limited. Books will be given out on a first come, first served basis to qualifying nonprofit organizations & schools while supplies last. Pre-registration does not guarantee that you will receive books. Agencies must arrive with their own transportation to pick-up books. Books will be an assortment of children’s and young adult books in manageable boxes ready to be loaded. Agencies will not be able to sift through boxes to pick and choose books. They reserve the right to request identification of your nonprofit or education status at any time.